Confession: A few days ago when I should have been researching new feature motorcycles for Moto Rivista, I was actually online shopping looking for my next pair of sunglasses. When what should I come across, none other than RETROSUPERFUTURE®’s SS2014 Motorpsycho collection. You can imagine my relief when I saw what had been revealed along with this new collection, that’s right, the feature of the day! The stars aligned for me, I found my next pair of shades and we were able to meet a new builder to feature on Moto Rivista. Introducing Federico Pazzi, Pier Francesco Pazzi, Eugenio Rapposelli of Basic Garage from Milan, Italy. Pier tells us “We customize motorcycles by creating teams of builders with different skills depending on the project. We started in 2011 working with a small laboratory in Abruzzo (Luthor, Tarantula, Apocalypse) and now we are working on new projects together with different teams in Milan, as well. 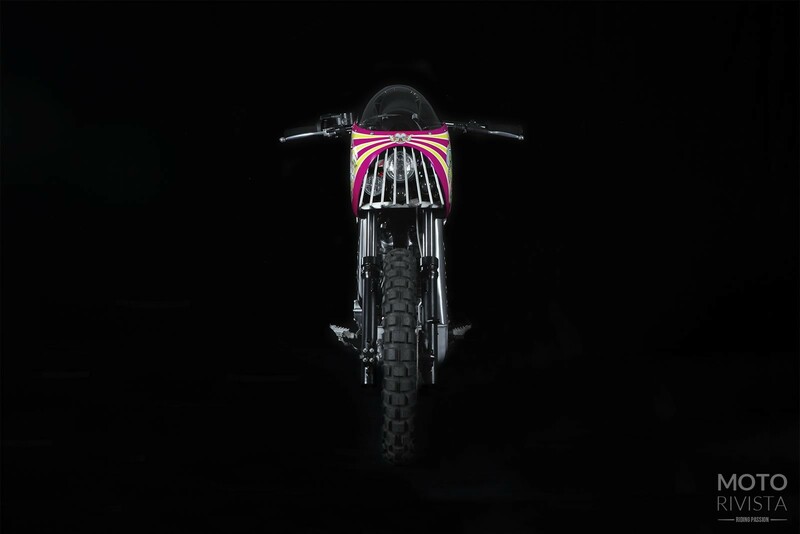 The first motorcycle we did in Milan is the Motorpsycho for the RETROSUPERFUTURE® brand. 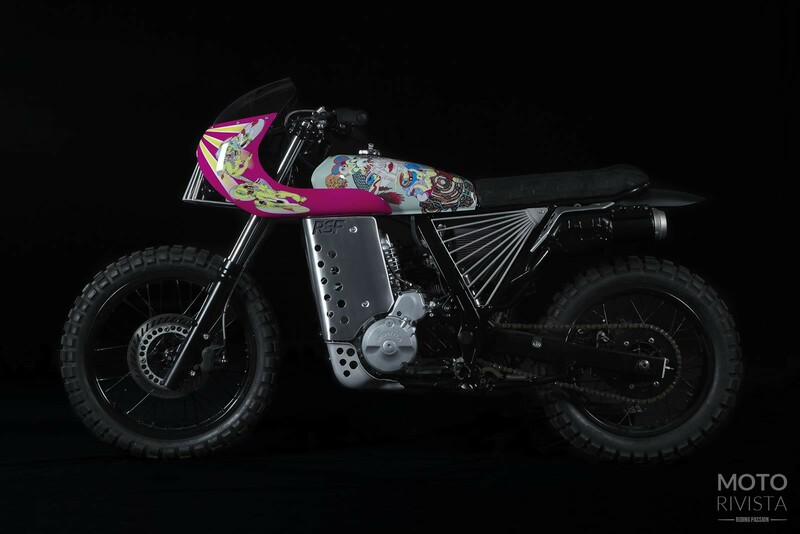 We give our customized motorcycles names of comic villains: they are fascinating powerful losers. Without them there wouldn’t be any heroes. We are also organizing, together with Anvil Motociclette, the summer event SunRide Motospeciali (riders meeting, custom exposition, music festival)”. 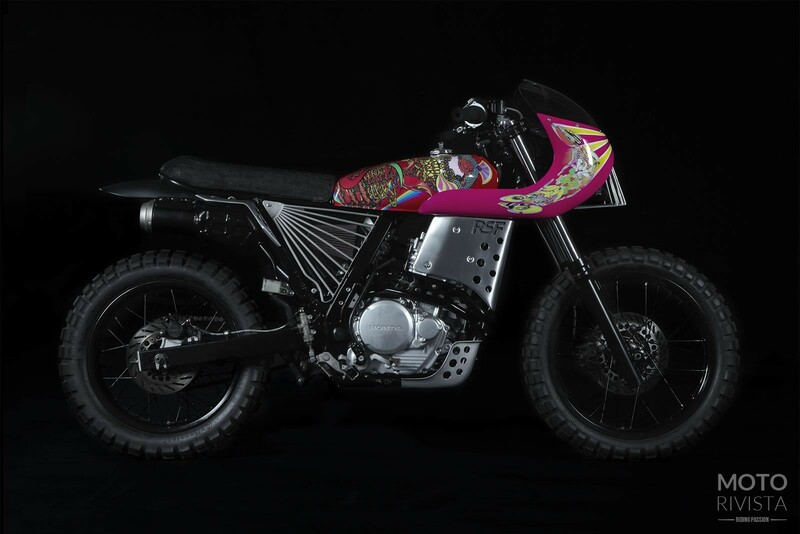 On to the bike, Motorpsycho is based on a 1988 Honda NX650. Conceived by RETROSUPERFUTURE®’s creative team, Basic Garage and the exclusive artwork by Japanese legend Keiichi Tanaami as a tribute to the alternative lifestyle that inspired this year’s Motorpsycho collection. This special project celebrates youthful rebellious countercultures, cross-country road trips, subversive psychedelia and the endless search for liberty. 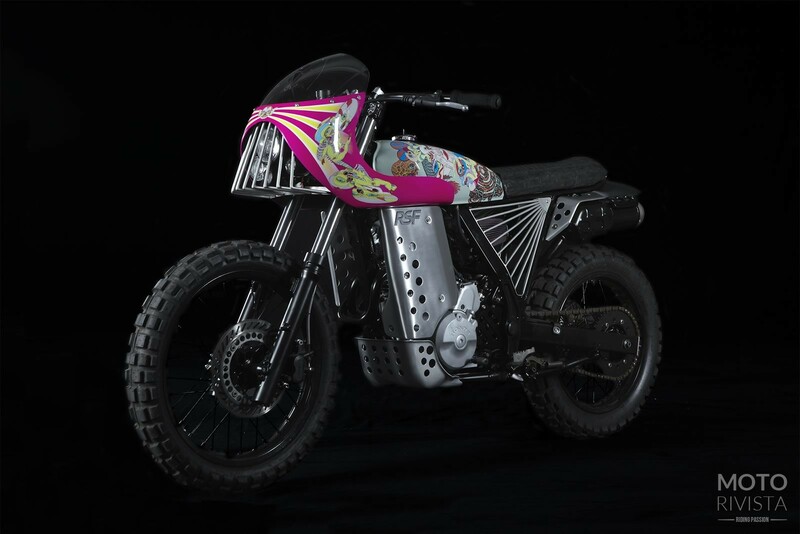 Keiichi Tanaami one of the leading pop artists of postwar Japan has poured his creativity and imagination into this ironically appealing pattern, perfectly designed to fit the motorcycle’s curves and shapes. RETROSUPERFUTURE® has a tradition of collaborating with exceptional craftsmen, this custom 1988 Honda NX650 is no exception. Working side by side, RETROSUPERFUTURE® and Basic Garage’s craftsmen have built and equipped this classic bike with unique materials and features, such as unique steel grills on the front and side of the bike, custom-made black chicken leg-skin for the seating, moulded aluminium side panels, black steel braided brake line, and, above all hot psychedelic bodywork sporting Tanaami’s eclectic skeletal drawings. 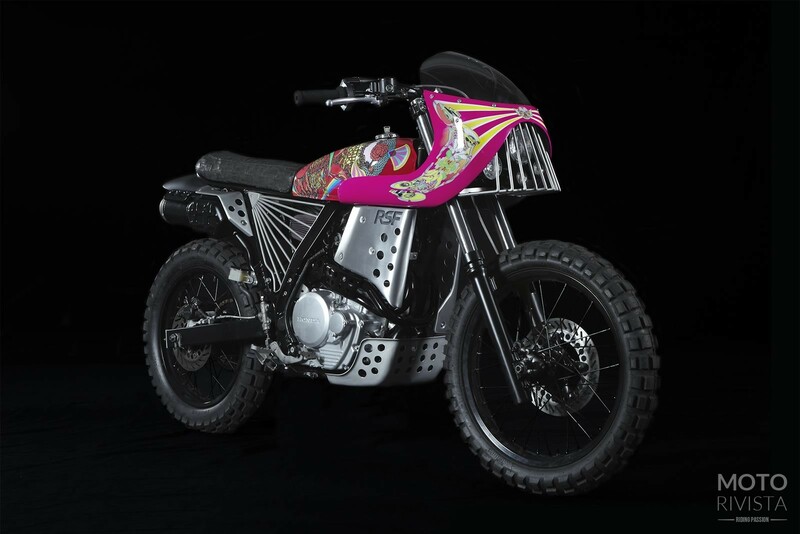 Celebrating exceptional creativity and out of the ordinary craftsmanship, the RETROSUPERFUTURE® motorcycle Motorpsycho is a unique one-off artwork. Whilst not available for purchase, Motorpsycho will be exhibited worldwide at select shows. Watch the video of Keiichi Tanaami’s work on Motorpsycho. The killer artwork by Keiichi Tanaami makes Motorpsycho look enchanting and complements the curves and the shape of this beauty. 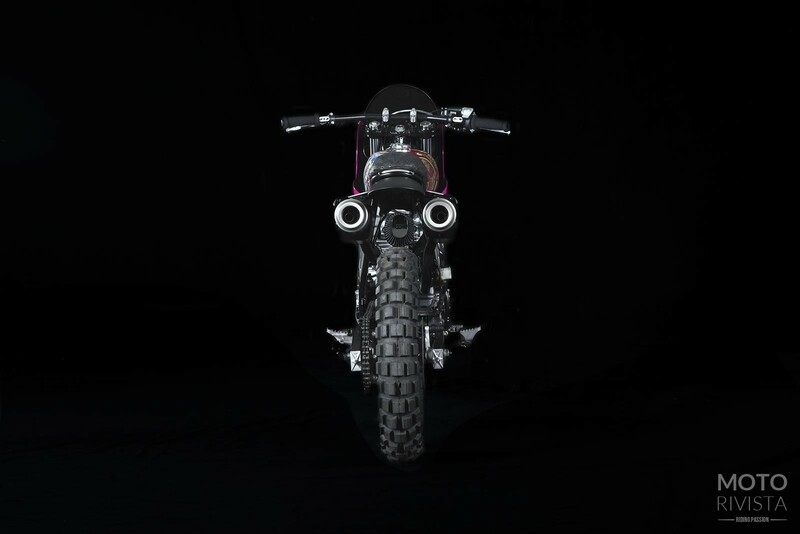 While the handmade fiber fairing and the custom-made aluminium side panels are some of the key elements of this stellar craftsmanship by Basic Garage.